Somehow, I missed the growing popularity of Joey & Rory in the country music world in recent years. I have always been one to switch from music genre to music genre every few months--but, with three teen/tween girls, my last several years have been spent listening to Pop, Rock, and (sometimes) old-school country music. Nothing "new" country in a long time. I did; however, catch pieces of the Joey & Rory story toward the end of Joey's life--and was drawn to learn more about them in Rory Feek's book, This Life I Live. What did I think of This Life I Live? About This Life I Live by Rory Feek. The story she said he was born to write. Her story. His story. The love story of Joey and Rory. By inviting so many into the final months of Joey’s life as she battled cancer, Joey and Rory Feek captured hearts around the world with how they handled the diagnosis; the inspiring, simple way they chose to live; and how they loved each other every step of the way. But there is far more to the story. Written by half of the GRAMMY winning duo Joey+Rory, Rory Feek, This Life I Live goes into Rory Feek’s childhood and his love story with Joey – from how they met, to their “long goodbye”. This book is already a New York Times, Wall Street Journal, and USA Today bestseller! Rory Feek is a great storyteller. Of course, I guess, this shouldn't be a surprise as he has been a songwriter for a number of years. However, I think it's a little more difficult to engage a reader over a couple hundred pages than a listener for a couple of minutes. This Life I Live tells Rory's life story--from his difficult upbringing through meeting Joey, losing her to cancer, and his present day life--and readers will be pulled along by his mild, honest, matter-of-fact tone and his openness. This Life I Live is a sad story--but, not entirely. While this book could certainly have been written with a woe-is-me slant--readers won't find that in Rory Feek's words. In the early pages, he talks about his parents and their turbulent relationship--and his many ups and downs growing up--but, he looks back on the characters of his life with honesty and real emotions--and generally finds a lot of positive points in those relationships. Later on, as he and Joey adapt to their differences in goals and plan--he approaches those honestly and with hope as well--but, doesn't sugarcoat the realities. When Joey asked him, later on, if God was going to heal her--Rory responded with the same honesty and soft-spoken, matter-of-factness that readers will find throughout the entire book. Rory Feek tells a sad story--but, he also tells a story of finding God, finding peace, understanding love, and moving forward with hope. Would I recommend This Life I Live by Rory Feek? I love memoirs--and, in a sense, that is what Rory shares in this book. This is his life story. His ordinary, yet extraordinary, story. This is his love story with Joey. This is the basis for his future with his daughters. If you are a fan of Rory & Joey--I think this is a must read. But--even if you have little idea of who or what the duo was about--as I did--this book is a great read for fans of memoirs or autobiographies. Feek writes in a very simple, down to earth, realistic style. He seems to be just an "ordinary" guy. He doesn't sugarcoat life's realities--nor seek to gloss over personal imperfections. He pens his thoughts, his emotions, and his experiences for the world to read as he sheds light onto the lives and life experiences that helped Joey & Rory emerge and evolve. Readers are not beaten over the head with religion in this book--but, Christian faith does take on a more prominent role as the book progresses. I think this is a wonderful book of perseverance, inspiration, and hope--dotted with finding the meaning of love and life--and learning to make sense of loss and grow from it. 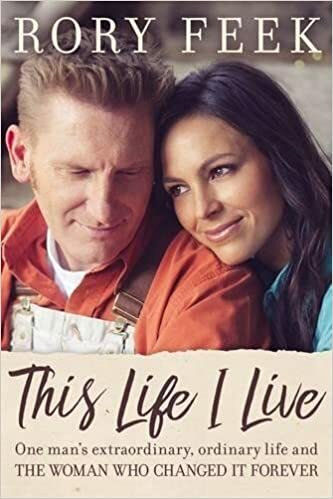 Buy This Life I Live by Rory Feek on Amazon. A true renaissance man, Rory Feek is known as one of Nashville's premier songwriters, entrepreneurs, and out-of-the-box thinkers. He is a world class storyteller that crosses all creative mediums from music and film to books and the Internet. As a blogger, Rory shares his heart and story with the world through his thislifeilive.com blog that has over 2 million Facebook followers. The love story of he and his wife, her recent battle and loss to cancer, and his vignettes of unwavering faith and hope in the face of tragedy inspire millions of readers who follow along with each post.As a songwriter, Rory's written multiple number-one songs, including Blake Shelton's "Some Beach", Easton Corbin's "A Little More Country Than That", and Clay Walker's "Chain of Love", and had dozens of other songs he's written recorded by Kenny Chesney, Randy Travis, Reba, Trisha Yearwood, Waylon Jennings, and many others. As an artist, Rory is one-half of the Grammy nominated country-music duo Joey+Rory. He and his wife Joey Martin toured the world, sold hundreds of thousands of records, and had their own weekly hit television show that aired all across the country on RFD-TV. Their latest album "Hymns That Are Important To Us" sold 70,000 copies the first week and debuted at number one on the Billboard album charts. He and his 2-year-old daughter Indiana live an hour south of Nashville in an 1870's farmhouse near their family-owned diner, Marcy Jo's Mealhouse.